a plethora of special guests representing the finest in the Washington area at this multi-band event which celebrates the life and songs of Buddy Holly. Hosted by JP McDermott. February 24 - Rockin' Dance. 9:00PM-Midnight. Swing dance lessons start at 8:00PM. Charity Fundraiser for the DC Coalition against Domestic Violence. The wood dance floor accommodates up to 400 dancers and there are seating rooms off the dance floor for quiet conversations. Be there in your best vintage threads! Fifty percent of all CD sales will go to Charity. Note: Advanced tickets must be purchased by 5:00PM on Friday, February 23. **MARCH 24** - CD Release at the Cat's Eye Pub! 9:30PM-1:30AM. Celebrate the release of our new CD, Come Back To Me! **MARCH 29** - CD Release at JV's! 9:00PM-1:00AM. It's our CD release on the other side of the Potomac! Hear original songs off the new CD at the Crown Jewel of Rt. 50! March 31 - Private Party. April 22 - 28 - BLUES DELUXE - BLUEBLOODS. Featuring a cut from our new CD, Come Back To Me on the Blues Deluxe FM Radio Show, a nationally syndicated program. See station roster to find affiliate stations and show times! **MAY 5** - Mom's in the Kitchen. 8:00PM till around 11:00PM. It's a Cinco de Mayo Sí-D release fiesta at Mom's! We'll be rockin' it with tunes from the new CD! Great food, relaxed atmosphere and room to dance! Directions:Take Rt. 4 South till you get there! Mom's in the Kitchen is on Rt. 4 (Solomons Island Rd.) on the left in the Prince Frederick Shopping Center just south of Rt. 231. June 3 - Concert. 1:30PM-2:15PM. It's the Washington Folk Festival! For the first time in WFF's 27-year history, the venerable genre of rock'n'roll has been added to the roster of American folk arts with the addition of Dagmar and The Seductones. This year marks the 27th Annual Washington Folk Festival, running from noon to 7:00pm on Saturday and Sunday. The festival features music, dance, storytelling, and crafts from artists in the Washington, DC area, with performances representing cultures from around the world. After her performance, you may find Dagmar riding the restored Carousel! The Festival is sponsored by WAMU 88.5 FM. June 10-11 - Video Shoot. Dagmar and The Seductones' first full performance video to be released this summer! Details to come--Keep Checking This Space. June 30 - Concert. 7:00PM-10:00PM. It's the Hot Harbor Saturday Night Concert! Dagmar and The Seductones will be rockin' the waterfront each month this summer at the beautiful outdoor Ampitheater at Harborplace and The Gallery. It's The central point for citywide celebrations in Baltimore. Also see July 15 and August 5. Free. Directions: The HarborPlace Amphitheater is located at the northwest corner of the Inner Harbor, between the Light Street Pavilion and the Pratt Street Pavilion - of HarborPlace, Baltimore, Maryland. Call 1-800-HARBOR1 for more infomation. July 5 - The Birchmere. 7:30 pm. Star Spangled Blowout Exravaganza! 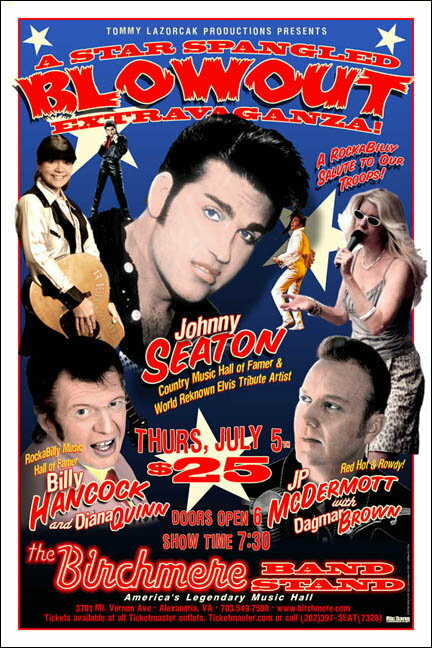 With Johnny Seaton/ Billy Hancock/Diana Quinn/J.P. McDermott/Dagmar Brown. All standing, in the Bandstand. Doors 6pm. July 15 - Concert. 4:00PM-7:00PM. It's the Celebrate America Sundays Concert Series brought to you by Harborplace and The Gallery. Dagmar and The Seductones will be rockin' the waterfront each month this summer at the beautiful outdoor Ampitheater at Harborplace and The Gallery. It's The central point for citywide celebrations in Baltimore. Also see June 30 and August 5. Free. Directions:The HarborPlace Amphitheater is located at the northwest corner of the Inner Harbor, between the Light Street Pavilion and the Pratt Street Pavilion - of HarborPlace, Baltimore, Maryland. July 21 - City of Manassas Park Summer Concert Series. 6:30PM-8:00PM. Our sixth year in a row performing at beautiful Signal Hill Park. It has picnic tables, shade trees, rolling lawn, and Dagmar and The Seductones rockin' the log stage. Before the show, why not take a dip under the faux palm trees at the water park pool? City of Manassas Park--The Newest City in Northern Virginia. August 5 - Concert. 4:00PM-7:00PM. It's the Celebrate America Sundays Concert Series brought to you by Harborplace and The Gallery. Dagmar and The Seductones will be rockin' the waterfront each month this summer at the beautiful outdoor Ampitheater at Harborplace and The Gallery. It's The central point for citywide celebrations in Baltimore. Also see June 30 and July 15. Free. August 23 - Metro Park, Arts al Fresco lunchtime concerts. 11:45AM-1:30PM. A great way to enjoy lunch & rock'n'roll. Metropark is directly across from the Rosslyn metro between N. Moore and N. Lynn. It's free and outdoors! August 25 - The Quarry House Tavern kicks off Rockabilly Saturday Nights! Dagmar's set starts at 10:00PM. Bands from 5:00PM-1:00AM, including The Droptops, The Gulley Jimson Quartet, The Garnet Hearts, and more! Hosted by JP McDermott. September 15 - Lead Sled Festival. Dagmar and The Seductones Headline this year's Festival! 2:00PM till 4:00PM is our slot. It's all about Rock'n'Roll and Classic Cars! In addition to Dagmar and The Seductones, the festival will feature Glenn Moomau and the Blue Flames, plus raffles, food and more. Proceeds benefit the restoration of the Polish Home Hall located in Curtis Bay. October 27 - Private Event (Fairlington, VA). October 28 - McGinty's Public House. 8:30PM - 10:30PM. Swing Dance with Dabe and Janelle. Bring your dancing shoes! It's a new thing--Silver Spring swings on Sundays at McGinty's! Open to the public.